Posted on April 29, 2016 by Kristine Carlson. This entry was posted in Eating Well. Bookmark the permalink. We are lucky to live in the Pacific Northwest, where an abundance of locally grown produce, livestock, seafood, and countless other foods and beverages are available. While Seattle hosts several year-round farmers’ markets, May marks the official start of the “farmers’ market” season, where you will find a bounty of fresh and seasonal foods. Local foods are seasonal. True, it would be great to have fresh tomatoes and berries all year round, but eating seasonally means avoiding “artificial ripening” with gases or eating a bland version of a fruit or vegetable that’s been shipped thousands of miles. Eating seasonally results in the most delicious and nutrient-dense produce. UWMC Plaza Café – The Plaza Café hosts a Farmer’s Corner held every second and fourth Wednesday of the month. It is a great time for UWMC guests and staff to come together to enjoy local and organic produce and foods. And did you know that over a quarter of the café’s purchasing dollars are spent locally? To highlight some of our favorite local farmers, we celebrate Farm Fresh Fridays with specials featuring foods from a local farm. Seattle Markets – For a list of Seattle farmers’ market locations, visit seattlefarmersmarkets.org. There you can also find out more about the vendors, what is ripe and ready that week, and about upcoming programs and events. Plus, show your Husky Card or UW Medicine ID on the first Saturday of every month and receive a $2 discount coupon for the U District Seattle Farmers Market. 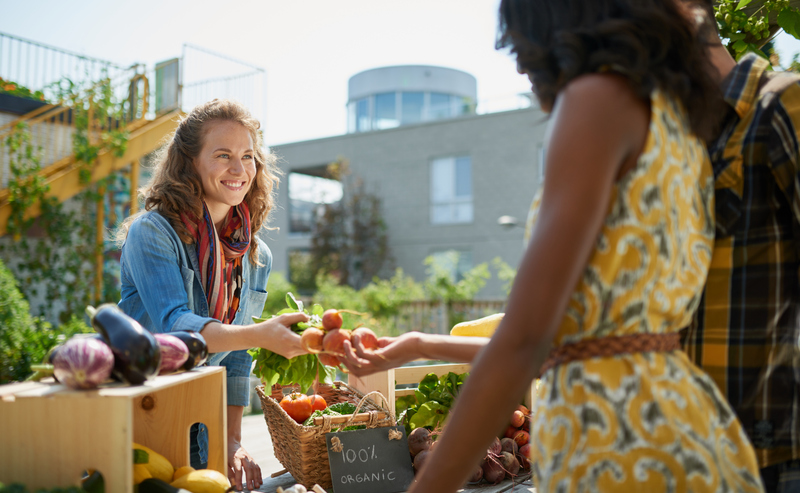 Community-Supported Agriculture (CSAs) – There are dozens to choose from with a variety of pick-up locations, and some even offering local delivery. UW faculty and staff receive a discount from Boistfort Valley Farm and Full Circle. See all food discounts here. If you’re ready for even more inspiration, here’s a seasonal recipe using locally grown produce. 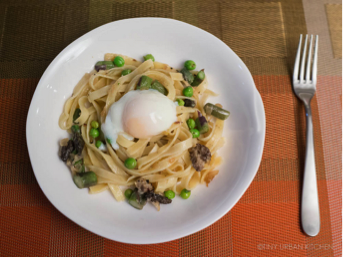 A beauty of a dish; this is one of my spring favorites! Add the asparagus and peas; sauté for about 2-3 minutes or until lightly cooked (al dente). What’s your favorite spring produce? Please share in the comments! 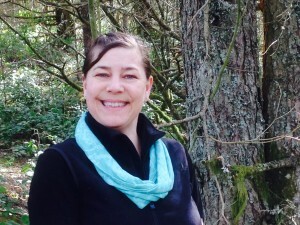 Kristine Carlson is a registered dietitian and certified nutrition support clinician who works in the Surgical and Medical Intensive Care Units at the University of Washington Medical Center. Outside of work she enjoys exploring Seattle with her husband Dave, hiking, yoga, cooking, swimming and spending time with her dog, Charlie. Great article. Keep up the facts for us all so that we can benefit from them in our daily lives.